Mangersta, like most occupied townships in Lewis, was relotted in 1849, with 15 crofts laid out and tenancies and rents allocated. Most, if not all, of the original tenants were long-standing inhabitants of Mangersta and the immediate vicinity (though Mangersta had been briefly given to sheep) and they included several members of the family of boatbuilding Macleans. **Croft 14, on the map “Murdo Maclean (Malcolm), Carpenter, formerly No. 7″ and “£ 2.10/0″ are added. In 1851 the Chamberlain, John Munro Mackenzie, was having the usual difficulty in collecting half-yearly rents. By the time of his spring tour of the island in February, he had devised a scheme for assisted (and to some degree compulsory) emigration for those of his tenants who were unlikely, based on arrears and stock values, ever to clear their debts. Six families of Mangersta (of which two were willing), comprising 34 people, were advised to emigrate in the summer, when James Matheson chartered ships to carry1,772 Lewis folk to Canada. It’s not clear which six families the Chamberlain had in mind but some correspondence with the information below can be expected. Note that the push to emigrate came after the lotting; and some of the accumulated arrears must have been carried forward from the pre-1849 holdings. Mangersta, like other townships, struggled on. In 1872 the tenants requested that they be moved to better ground as the exposed site was causing them problems. Most of the families removed to new ground at Doune Carloway. 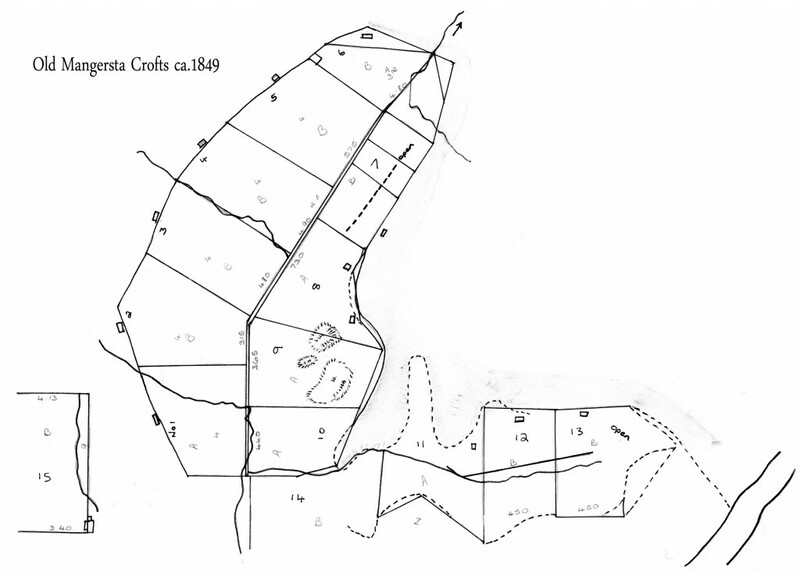 The following croft-by-croft account gives the families in the village from about 1849, and their destination after the end of Old Mangersta. Compare also the lists of tenants in 1824 and 1867. From 1872 Mangersta was a single farm, occupied by Donald Mackay and family; it was of course resettled, with 13 crofts, in 1911. The information below is compiled from old Comann Eachdraidh records and the census; if you can add or correct anything, please do. The croft was originally let to John Macaulay but he and Angus Maclean (originally No. 8 ) exchanged. Angus Maclean born 1804 was known as An t-Saoir Dubh (the boatbuilder). He was the son of Calum Maclean, born 1756, who appears on the Mangersta tenancy lists in 1807, 1819 and 1824. Angus was married to Kirsty (Morrison) 1814, and had children Donald 1834, Calum 1836, Catherine 1838, Peggy 1841, Murdo 1845, John 1848, and Norman1851. In 1872, these went to Doune Carloway: Angus above, wife Kirsty, children Margaret and John; also son Donald above with his wife Mary and son Angus. Before 1861, the croft was taken over by Peter Macleod (1804) from Carnish, his wife Ann 1803, children Jean, John and Donald. In 1872, Peter and Ann moved to Doune Carloway with children John, Donald, Janet and Ann. The original tenant was Calum Macdonald 1787 (Calum Aonghais Fionnlaidh) and his wife Peggy 1796, children Kenneth, Kirsty, Calum, Finlay. In 1872, these went to Doune Carloway: Margaret Macdonald, widow of Calum above, son John with wife Betty and children Donald, Calum, Kirsty and Margaret; son Kenneth Macdonald with wife Ann and child Calum; son Donald with wife Catherine and child Mary Ann . The original tenant was Donald Smith but his name was replaced by that of his son-in-law Kenneth – who had originally been intended for No 3. The family was Kenneth Morrison 1814 (a weaver), his wife Margaret 1814 (nee Smith, daughter of Donald below), children Catherine 1840, Angus 1842, John 1844, Marion 1847, Donald 1850. Also on the croft, the said Donald Smith 1773, wife Ann 1771, daughter Mary 1807. In 1872, these went to Doune Carloway: Margaret Morrison 1814 (widow of Kenneth, daughter of Donald Smith) with children Angus 1843, Donald 1850, Ann 1853, Margaret 1857, Kirsty 1860 and her sister the above Mary Smith . The original tenant was Angus Maclean 1771(Aonghas ‘ic Dhomhnaill) who appears on Mangersta lists in 1807, 1819 and 1824; his wifeMary 1776, Kenneth 1821.Angus’s son Donald (1819), his wife Ann (1817) and daughter Flora (1850) were also in Mangersta. In 1872, these went to 15 Crowlista: Ann Maclean (widow of Donald, above), children Flora 1851, Kirsty 1853 and Angus 1855. Also Catherine Maclean (widow of Kenneth above), children Angus 1860 and Mary 1862. The original tenant was John Macleod 1791(Iain Chaluim) and wife Kirsty 1795, children Betsy 1828, Calum 1831, Murdo 1836, John 1839, Donald 1841; also living there, Peggy Macleod 1837 and Betsy Macleod 1831. In 1872, these went to Doune: Murdo Macleod son of John above, his brother John, Isabella and Catherine. The croft was originally let jointly to two widows. Widow Mary Macaulay (or Maclean) 1796 and her son Donald 1829.In 1872, Mary Macaulay went to Doune. Isabella Macleod 1801 (widow of John), sons Donald 1835 and John1838. In 1872, these went to Doune: Isabella Macleod above,and her children Donald above and Ann 1836. There was also a Calum 1832 in the family. Donald later returned to 1 Ungeshader. The original tenant was Angus Maclean, who exchanged with John Macaulay for No 1. The family was John Macaulay 1806 and his wife Margaret 1806; children Donald 1839, Murdo1843, Malcolm1846.Despite getting the croft, John emigrated to Canada in 1851 and settled in Whitton. Before 1871 the croft was taken by Murdo Macleod 1811 from ArdBheag (Murchadh na h-Airde), with his wife Jean 1826, Donald 1855, Kirsty 1857, Calum 1859, Angus 1862, Marion 1863. In 1872, these went to Doune: Murdo Macleod (above), wife Jean, children Donald, Kirsty, Calum, Angus, Marion. The original tenant in 1849 was Calum Maclean 1818 (Calum Beag, brother of Angus No. 1), his sister Peggy 1837, his mother Ann 1779 (widow of Calum Sr), and a John Macdonald 1826. In 1872, these went to Doune Carloway: Calum, his wife Ann, and children Donald, Catherine, Calum, Kirsty, Betsy and John. The original tenant in 1849 was Donald Macdonald 1797 (Domhnall Aonghais Fionnlaidh), wife Kirsty 1803, son John 1834; also a Kirsty Buchanan 1843. In 1872, these went to Doune Carloway: John Macdonald (above), wife Catherine, children Ann 1861, Donald 1862, Murdo 1867, Catherine 1869, and his mother the widowed Kirsty (above). The original tenant in 1849 was Norman Macleod 65 (Tarmod Buidhe, a pensioner of the 78th), his wife Margaret 1794, Kirsty 1813, Hugh 1827,Margaret 1829, Mary 1838. The original tenant in 1849 was John Maclean 1828 (Iain IainDeirg) and his wife Ann 1830, son John 1850. Also his brother Angus Maclean 1833, and others, Donald Macleod 1833, Angus Macleod 1833. 1872, these went to Doune: the above John Maclean and wife Ann, children John, Isabella, Donald and Kirsty. Also his brother Calum Maclean (Calum Buidhe) and wife Marion (daughter of Iain Mhurchaidh from Carnish) and their children Donald, Isabella, Murdo, Mary Ann, John, Kirsty and Peggy. The original tenant in 1849 was Finlay Macdonald (Fionnlaidh Mac Aonghais), but after his death the tenancy was given to his son Alexander Macdonald (see 15A). On the croft were Effy Macdonald 1799 (widow of Finlay), Kirsty 1827, Marion 1833, Angus 1835, Donald 1841, Ann 1843. No notion of where they went before or at the time of clearance in 1872. Alexander appears not to have remained in the village after the 1850s so the croft may have gone to one of the new arrivals below. The original tenant in 1849 was Angus Macleod 1796, with his wife Kirsty 1786, Margaret 1846, also Rachel Matheson 1836. Angus moved to Carnish by 1851. When Angus died with no heirs, the croft was taken over by Angus Smith 1816 (Aonghas a’ Ghobha), and his wife Kirsty 1812, children Catherine 1833, Hannah 1835, Catherine 1838, Marion 1842, Ann 1845 and John 1849. They emigrated to Quebec. The next tenant was Murdo Maclean 1820 (boatbuilder, a son of Calum, brother to Angus No 1 ), with his wife Peggy 1821 and son Calum 1850. In 1872 these went to Doune: Margaret widow of Murdo (above), children Calum, Margaret, Donald and Flora. The original tenancy in 1849 was shared between Murdo and John Maclean below, sons of Calum Maclean and brother of Angus at No. 1. In 1872, Murdo Maclean moved to Doune Carloway, but after the others. John Maclean 1801 (brother of Murdo 15A) and his wife Ann 1815, children Murdo 1836, Donald 1838, Margaret 1840, John 1842, Catherine 1844, Mary 1847, Calum 1851. Donald Macaulay 1811 (from Timsgarry), Catherine 1811 (second wife, daughter of Calum Maclean, sister of Angus 1 Mangersta), children Donald 1831, Mary 11834, Ann 11836, Kenneth 1840, Malcolm 1843, Catherine 1845, William 1847 and Ann 1850.They left Mangersta before the lotting and settled in Winslow, Quebec. Murdo Macaulay (Murachadh Dubh) 1811 and his wife Marion 1814, children Ann 1836, Margaret 1836, Donald 1838, Calum 1841, John 1843, Catherine 1845, Angus 1846, also Norman Macaulay 1818.This family did not get a croft in Mangersta at the lotting. They moved to 1 Islivig before 1851 and emigrated to Quebec from there. John Maclean 1822 and his wife Kirsty 1822. They appear to have left Uig before 1861, for parts unknown. Angus Buchanan 1840 (Aonghas Mhurachaidh) Kirsty, children Calum and Murdo. From Carnish before 1861. John Macleod 1821, his wife Janet 1814, also Donald 1788. From Carnish before 1861. Calum Maclean 1822, Marion 1809, children Donald, Isabella, Murdo, John, Kirsty, Peggy. Moved from Carnish to Mangersta before 1861. Margaret Macdonald 1826; in Mangersta in 1861. Hector Morrison 1802, Schoolmaster from Gairloch, his wife Ann 1804, daughter Margaret 1835, and granddaughter Jane Barnett 1856. They come to Mangersta before 1861. Mary Macrae 1813, daughter Margaret 1835 – from Ceann Chuisil, they arrived in Mangersta before 1871. Very interesting-it’s good to see the old Comunn Eachdraidh records restored and on-line. All members of the family were relocated to Uigin by 1871, with the exception of one child, John, who was relocated to Islivig and lived with his maternal aunt, Catherine (nee Matheson) MacAulay. Very interesting information and great to have them available online. Can anyone direct me towards information regarding the inhabitants of Ceann Cuisil? Were they evicted and if so, is there any record of when?